It sets in once you've gained a little momentum, when things get easier and you might be starting to see some first results. 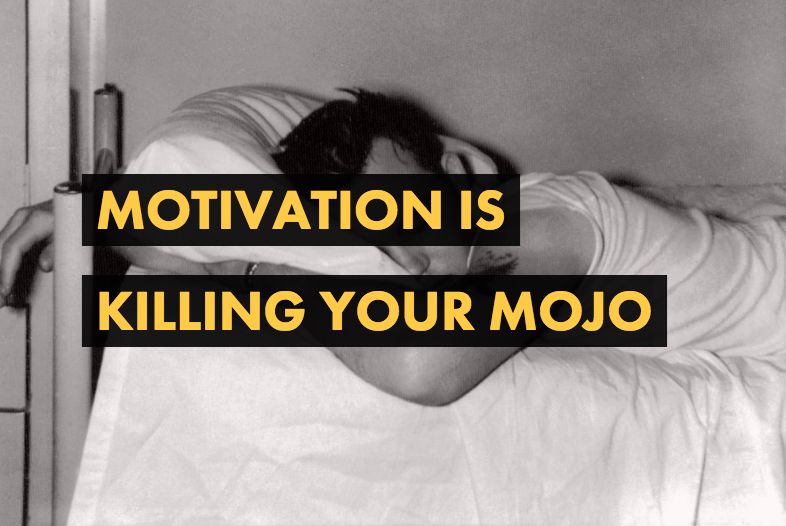 And you can forget all about motivation once you've reached the state of flow. So how can you use this in your own life? 1. Start with something really really tiny. Want to jog, so you don't get out of breath on stage? Start by putting on your workout gear and give yourself permission to stop after 5 minutes. Need to get your marketing under control? Sit down and take a few minutes to start outlining your goals for the next 2 weeks. Need to book more gigs? Open google and research one venue... you get the drift. And remember to keep it tiny, we're trying to make getting started easier. 2. Block some time in your calendar to do it - and then actually do it. Personally, I can do this with some tasks but not with others, but it works brilliantly for lots of people and you should totally give it a go. If it doesn't work - do the opposite. Block some time in your calendar for fun stuff - when you can play, or do nothing, without feeling guilty. This is something I first heard from Neil Fiore, psychologist and author of The Now Habit. The point is, get conscious about the time you're spending and don't simply do a bit of nothing all day long. And 3. get yourself some accountability deluxe, the kind that really lights a fire under your fashionable pantsuit. Don't just say you'll do something - promise it to someone you actually respect, even better if you need to pay for something or do something somewhat painful, in the obviously very unlikely case that you break your promise. The lingering threat of having to post a video of myself singing, cough, 'Achy Breaky Heart' (thanks for that pick, Matthew!) just led to a very productive week on my end. If that sounds like something you should do too, why not join a whole group of fellow artists becoming the boss of their careers?! Come on over to Facebook and join the Boss Artist Mastermind. It's free, and invaluable.